The Before We Beginroom is coming up like these things do: one wall at a time. As theatre-folk, when we say "walls," what we mean are "flats," ie, fake walls that create space. These are common base-objects in lots of plays -- particularly when you're using black boxes that need help defining the performance space and creating architecture. We're pretty lucky that we have some storage at our house so that when we finish a show we can actually store the flats and use them again. Each show, however, wants a different scenic feel, which means that unearthing flats is like a trip through your past shows. 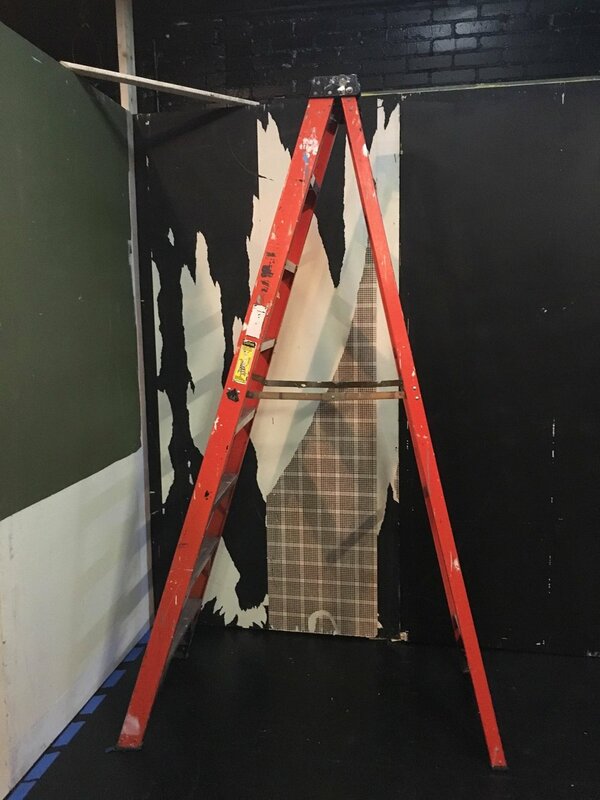 By the time audiences see Before We Begin, of course all of this will be covered up, but right now in the Black Box I can personally see the ghosts of three past shows on these flats. And here's some in their original incarnation. This wallpaper looked super familiar and I couldn't place it. . . .
Then I remembered we loaned the flats to our pals at Elemental Theatre Collective in 2012 for their show Vacancy, and they had wallpapered it to look like a cheap motel room. I wish I could find a picture of that online, but sadly. . . we'll all just have to use our imaginations. Unless someone from Elemental can hook me up with a picture. . .
And soon all these concrete reminders of these past shows will be covered up by Before We Begin. Good thing we take pictures. Older PostBefore We Begin: In the Space!